Overfeeding or underfeeding Yorkies can lead to significant health complications which is why we have compiled a few reviews of some of the best dog food for Yorkies and if you don’t quite know what to look for when your reading these reviews don’t worry we have also compiled a buying guide for you. We provide you with the information you need to find the best dog food for Yorkies. Yorkies have become one of the most popular types of dogs around the world; you often see Yorkies used as fashion accessories i.e. purse dogs. Their small stature allows them to fit nicely into purses. However, as adorable as they look they are tough to please. Yorkie’s are known for their fussy appetites and tough dietary needs. How much should a Yorkie eat? If you want to know what Yorkies like to eat the first thing to look at is what the best dog food ingredients are. Yorkies like to eat foods that will provide them with appropriate amounts of energy and fiber. Let’s take a look at the three different macronutrients in dog food and how appealing they are to Yorkies. Carbs: When it comes to dealing with Yorkies you want to be careful with carbs, certain types of carbohydrates that are sometimes found in dog food can be rough on their stomach (We will discuss this in more detail in the ‘Foods To Avoid Section’). When your selecting dog food you want to make sure the food is rich in complex carbohydrates, something like brown rice or sweet potatoes would be adequate. However, when your selecting dog food with brown rice you should buy with caution as cheap brown rice sometimes contains arsenic you want to avoid this, always read the fine print on the nutrition label. Fats: When it comes to fats Yorkies need it to maintain their long, shiny coats. The best bet is to find certain dog foods that contain fish oil. A lot of times Yorkies don’t get the essential fats they need in their regular diet so an option would be to buy a fish oil supplement, more specifically liquid fish oils. What you can do is simply drizzle a few drops of fish oil on your Yorkies dog food. The next thing to look at when you’re trying to find out what kind of food you should buy for your Yorkie is deciding whether you should by dry or wet food. For a lot of people it simply comes down to personal preference for example, when it comes to dry food sure it can be very convenient for pet owners as all they have to do is scoop out the dry kibble rather than open a can of wet food but you need to do what best for your dog not what more convenient for you. Ok now let’s look into the actual differences between wet and dry food. Yorkies have relatively small mouths which mean they tend to have overcrowded teeth and as a result, they are at risk of developing a dental disease if food gets stuck in between their teeth. Wet food is more likely to get stuck in between their teeth than dry food, in fact, dry food can help clean your dog’s teeth. How so? Well, the dry food will scrape against the teeth as its being chewed, and as a result, the teeth gets cleaned (any buildup gets removed). Also, the wet food contains approximately 70% water and what the average pet owner doesn’t realize is that because there is so much water the nutrient label can be misleading. It is also a good idea to take your Yorkie’s age into consideration if the Yorkie is still a puppy and only a few months old than dry food is not an option. When Yorkies are first born, their teeth are not developed, so pet owners are forced to stick with wet food. Good options could include some chicken or fish broth until they are old enough to start consuming dry food. You’re trying to choose the best dog food for your Yorkie, and you’re probably wondering why you need to know how much a Yorkie eats. Well, the answer is we want you to choose the best dog food for your Yorkie without over or under feeding him or her. Just like with figuring out what nutrients each dog food had you want to start noticing how many calories each type of dog food has. On average Yorkies need about 30 calories per pound of bodyweight to maintain their current bodyweight. However, please remember that this number (30 calories per pound of bodyweight) is just a general approximation every dog is different and will have different caloric needs. For example, if your Yorkie is small (Under 20lbs) and very active they can consume up to 40 calories per pound of bodyweight per day. If you have a larger dog (50lbs and over), they can consume around 20 calories per pound of bodyweight, and that would be sufficient. Also, there are other factors that can alter the caloric requirements of your Yorkie, if they were neutered or if you live in a hot environment they won’t need as many calories. If you own a working Yorkie, the calories will significantly increase. An example of a working Yorkie could be a herding Yorkie or a Yorkie that spends most of their time outdoors. The different caloric needs discussed above can be described simply as the caloric need of a Yorkie will differ depending on their metabolism. If the Yorkie is overweight owners should increase their physical activity and reduce caloric intake, if they are under the average weight owners should increase caloric consumption. Split the meals into smaller portions, 3-5 meals split evenly throughout the day rather than 1-2 big meals. Track their calories – Remember knowing how many calories your Yorkie needs and gradually reducing them over a period will help keep your Yorkie nice and healthy. Royal Canin’s Yorkshire Terrier dry dog food is made to entirely to please Yorkies. The most significant feature is how they created the kibbles to be able fit into a Yorkies jaw, this is great considering Yorkies have significantly less jaw strength when compared to other dogs. 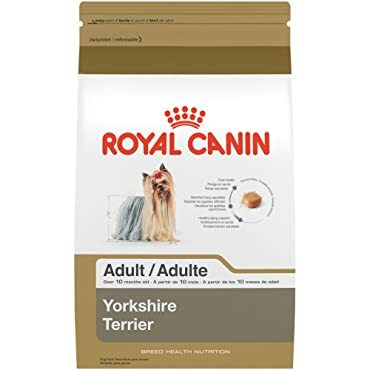 Also, we all know that Yorkies can be fussy eaters, so Royal Canin decided to make the kibble plate able or very appealing appearance. Another good feature includes having the essential nutrients (Omega 3 fatty acids (EPA and DHA), Omega 6 fatty acids, and Biotin). The dog food comes in either 10lbs or 2.5lbs so if this is you would like to test out this dog food you can order the smaller size without having to commit to 10lbs. The one downside to this particular dog food is that it is made for Yorkies who are ten months and older so if you have a puppy the Hill’s Science Diet Small & Toy Breed Dry Dog Food may be a better choice for you. Other than it not being made for puppies we would recommend Royal Canin’s Yorkshire Terrier dry dog food. If you’re looking for dog food that can be given to your Yorkie no matter its age or weight, you will probably want to take a look at this review. The Hills Science’s Diet Adult Small & Toy Breed dog food is a plant-based dry dog food that uses meat as its main sources of animal protein. When we first analyzed this product we liked it immediately because we knew with it being dry food, this will sit well with Yorkies. Secondly, the ingredient profile looked exquisite to us, the nutrition label states there are no artificial colors, flavors, or preservatives and that it has antioxidant benefits which are clinically proven. The one ingredient that stuck out to us was flax seed; this is superb as this is one of the best plant sources of omega-3 fatty acids; this will make the dry food easy to digest. Third, the options for this product are endless; they have options for puppies, overweight dogs, and underweight dogs. For example, we saw options to choose dry food made specifically for puppies, dry food that has 30% fewer calories than regular dog food which is great for dogs that need to lose weight, etc. The dry food is available for purchase in either 4.5lbs or 15.5lbs bags, so the one downside is that you are making a big commitment. If you buy a 4.5lb bag and your Yorkie doesn’t end up liking it you’re going to be stuck with 4lb of dog food. 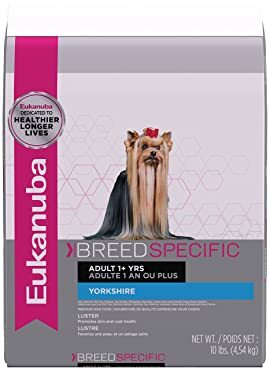 Eukanuba’s breed specific adult dry food is a plant-based dry dog food that uses a chicken by-product meal as its main source of animal protein. We like the fact that this dog food is made breed specific so it takes into consideration how Yorkies may have specific dietary needs. 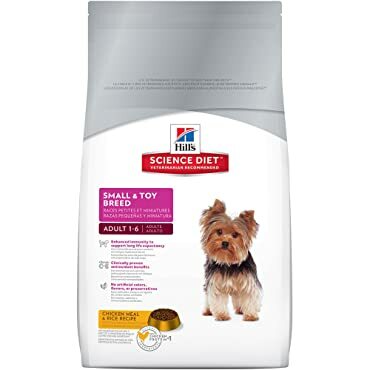 We also found a lot of similarities to Hill’s Science Diet Small & Toy Breed Dry Dog Food, they both included ingredients that support the digestion of dog food. For example, Eukanuba used a fiber blend of natural beet pulp and prebiotic FOS while Hill’s Science used fatty acids to help ease digestion and promote nutrient absorption. For fussy Yorkies, this product will be great as because of the main ingredient they will be able to enjoy the pleasant tastes of chicken. This product also contains zinc and copper which will keep your Yorkie’s skin nice and healthy. You are given an option of either purchasing a 10lbs or 3lbs, so you have the option to opt for the smaller size to test it out before committing to a 10lbs bag. The biggest downside to this product is the fact that only Yorkies who are 12 months or older can consume it. If you have a Yorkie puppy, your best bet is to opt for the Hill’s Science Diet small & toy breed dry dog food. When you’re choosing the best dog food for Yorkies, there are also certain health concerns you should be aware of. Before we start talking about the common health risk when consuming, dog food lets discuss the major risk Yorkie owners should be aware of. Yorkies are known for their sensitive stomachs, and they can quickly begin to refuse the foods that are given to them which cause them to be malnourished which then leads them to become hypoglycemic. Thus it is crucial to make sure Yorkies are given the food they enjoy and that provides them with adequate nutrition. During the macronutrient section of this article, we discussed the importance of complex carbs now; I would like to talk a little bit about what can happen if the wrong type of carbs is consumed. With Yorkies, you need to be cautious with the carbs as certain kinds can be hard on their stomachs, especially corn and soy. Feeding Yorkies food that contains fillers such as corn or soy could cause an upset stomach. The best food for Yorkies with sensitive stomachs is as we previously mentioned sweet potatoes and brown rice, it doesn’t have to be that exact meal, but the idea is to make sure the meal is rich in complex carbs. Please note that this doesn’t mean you have to completely stay away from corn or soy this just means that certain Yorkies who have sensitive stomachs should be cautious as to how much of these ingredients they consume to avoid any discomfort. Secondly, Yorkie owners also should watch out for dog foods that contain protein that is not from the muscle of an animal. This type of protein in dog food can also irritate a Yorkies stomach because the protein that comes from anywhere other than the muscles of an animal are usually processed garbage. Chocolate: This one is pretty obvious it is commonly known certain types of dogs can’t consume chocolate, and this includes Yorkies. ‘Theobromine,’ which is the main compound in chocolate can be dangerous and even lethal to small dogs like Yorkies. Grapes / Raisins: Certain dogs seem to have a very negative reaction to raisins and grapes, the compound that causes this negative reaction is unknown. After consuming a few the dogs begin to vomit followed by fatal kidney failure. Due to the uncertainty around this type of food and how lethal it can be we would recommend Yorkie owners stay clear. Fat: Earlier we discussed all of the benefits of having fat in your Yorkies diet but we would like to use this section to talk about what the bad fats can do to your Yorkie. For example, we talked about fish oils now those are good fats, turkey skin, on the other hand, are bad fats. These bad fats can cause health issues like pancreatic. What happens is the pancreas starts to get inflamed, and the Yorkie will start to feel stomach pain followed by vomiting. If your Yorkie begins to display these symptoms, your best bet is to take him or her to the vet as soon as possible. Raw eggs: There is protein in eggs, so this should be a good ingredient to have in dog food right? Well, this is both wrong and right, let us explain. Raw eggs should be avoided as Yorkies will be unable to absorb biotin resolution. However, cooked eggs are a great source of protein and can be good to add into a Yorkies diet in small amounts. The difference is that with raw eggs Yorkies simply can absorb it properly so if you were ever to find a dog food with eggs in it, please make sure it was cooked. Cooked bones: Avoid giving a Yorkie any cooked bones as it can easily splinter in the dog’s mouth, this will result in damage to the gums, digestive system, and throat. It could become even more dangerous if the bone were to get lodged in a Yorkies throat. If you were to give a Yorkie a bone with meat on it, please take it away once all the meat is gone. Cat food: In no scenario should Yorkie owners feed their Yorkie cat food; this is extremely dangerous for diabetic Yorkies as Cat food is very high in protein, fats, and sugar. Phosphorus: Dog foods that contain a high level of phosphorus and foods that contain macadamia nuts should be avoided as this can cause Yorkies temporary rear leg paralysis. Owners should stick to feeding their Yorkies around 150 to 200 calories per day if the Yorkie is still a puppy around 400 calories per day. Try and aim for dry food that has fish oils to keep their dog’s coat shiny, protein to maintain their muscle mass and complex carbs to use for energy. Owners may want to avoid dog foods with corn or soy could cause stomach upset for certain Yorkies, remember some Yorkies may be able to tolerate corn or soy. If you remember these key facts, you should be able to find the best dog food for your Yorkie.